Why Do My Dog's Paws Smell Like Corn Chips? Have you ever gotten a sudden craving for corn chips when your dog is around? Did you ever check your dog’s breath to see if they’d eaten your secret stash of Fritos®? I have heard people say their dog’s paws smell like corn chips or popcorn. I’d never really noticed it before. Then, I fell in love with a certain Basset Hound and it became all too clear what they were talking about. Why do dog paws smell like corn chips? “Corn chip feet” is usually nothing to get too upset about. Dogs walk through a lot of funky stuff during the day then they lick their paws. They also sweat from the pads of their feet. This combination is a perfect place for yeast and bacteria to live. Two particular bacteria Proteus or Pseudomonas are the reason for the chip odor. They like to mingle together in the fur between your dog’s nails and around his pads. Many people believe that it is caused by too much corn in a dog’s diet. This is not true, but you should try to avoid foods that list corn and other fillers as the first ingredients. It is just better for your pet. How can I stop the chip smell? In some cases, you are just going to have to learn to love the perfume of Eau de Chip. It is a natural and common effect of bacteria. To help combat the odor you can wipe your dog’s paws off with a puppy wipe after walking. Trim the hair between the toes and around the pads. *You can have a professional groomer do the job. Washing the dog’s paws will usually get rid of the smell for a while. Make sure to dry the paw thoroughly, between the pads and nails. **Always seek the advice of a veterinarian if the smell is bothersome or strong. It could be an infection that needs to be treated professionally. Happy National Corn Chip Day! Today is the Pet Parade Blog Hop! Join the fun with Rascal and Rocco, Bionic Basil’s Blog, Love is being owned by a Husky, and me to celebrate. Now I want some Fritos!! Lol Maddie smells like Fritos when she's sleepy! It's the normal sleepy pug smell tho! We like the smell of corn chips! Could be worse. Will you STOP sniffing me Mum!!!! I wish my paws would smell like corn chips :o) my mom said my paws smell like ole potatoes... or paw-tatoes? 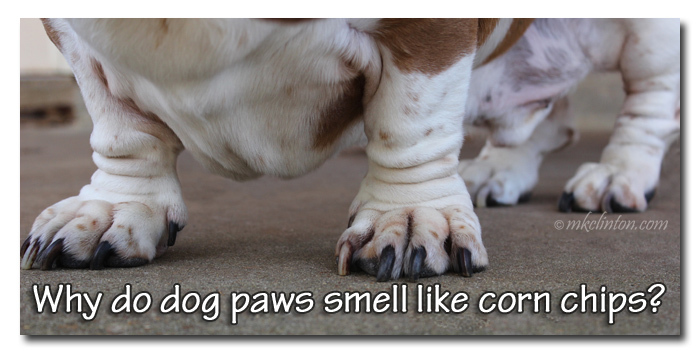 We hear this all the time, but none of us ever seem to have corn chip smelling paws. Mom says they just smell like dog paws whatever that means! Ah, yes, the Eau de Chip! While Huskies are typically odor free, there are those occasions when those paws do smell like corn chips! And yes, it is before they get the fur trimmed between their pads. I loved this post. I saw the title and said, "Yes!" great post! we call it cheeto or frito feet. Our MOM just ADORES our FREE TOES feets... She likes to get in bed and Cuddle us and SNIFF our Feets and the... (grumble groan grouch) wants to HOLD OUR PAWS until SHE goes to sleepl. I don't always notice it, but I don't mind it when I do! Some dogs have really good smelling ears too. I can't describe the smell, but Luke has it. I am weirdly seen smelling his ears a lot, and telling him how good they smell...LOL. If my feets smelled like corn chips mom would lick them. We've never heard of this. But we guess there could be worse things a dog's feet could smell like. Little Phoebe does sometimes have corn chips stench! I never knew what it was. Thanks for the advice on how to help combat it. So funny!! Hope you have a wonderful weekend!! I used to notice the smell a lot more often when Haley was younger, but for some reason I haven't noticed it at all in the last few years. It never bothered me too much until I realized what causes the odor, lol! BOL!!!! OMD, that is soooooo funnies!!! Sometimes Ma says my feeties smell like dog-paws, butts not really corn chips...I likes corn chips...Ma dropped one once and it was delish! I wish my paws smelled like corn chips, I would lick them all day long....BOL!! Interesting! I've never heard of or experienced this. Corn chip feel -- to funny. Glad it isn't anything serious. Thanks for sharing about this! Our dogs don't smell like that, but I read about this before.